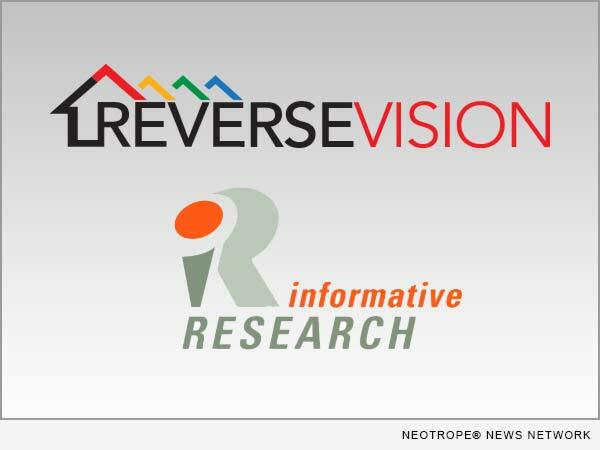 SAN DIEGO, Calif. /California Newswire/ — ReverseVision, the leading provider of software and technology for the reverse mortgage industry, announced it has completed its integration with Informative Research, one of the nation’s oldest and largest credit reporting agencies. The integration makes it faster and easier for users of RV Exchange (RVX) loan origination software (LOS) to order Premier Credit Report, Informative Research’s version of the tri-merge credit report that has become the mortgage industry standard. Credit information supplied by Informative Research is available in RVX as of the system’s June 16 update. “With this integration, Informative Research and ReverseVision assure their mutual customers unmatched access to critical credit data needed for originating reverse mortgages. Further, the integration helps support our unceasing commitment to improving lender workflow and streamlining credit reporting capabilities,” said Informative Research Chief Operating Officer Stan Baldwin. Founded in 1946, Garden Grove, California-based Informative Research is dedicated to providing the industry’s most accurate and complete residential mortgage credit reports and is renowned for its innovative technology. For decades, Fannie Mae and top lenders have trusted Informative Research and its proprietary Keystone logic system, which allows individual reports from the three credit bureaus to be merged into an easily understood, accessible format with duplicated or incomplete listings removed for lender efficiency. “Through this integration with Informative Research, RVX users will experience ease-of-access to the critical credit information required to identify qualified borrowers,” said ReverseVision Vice President of Sales and Marketing Wendy Peel. Informative Research enables lenders to customize how credit information is presented in a borrower’s report and consistently provides turnaround times that are among the industry’s fastest. It is particularly known for dedicated customer support specialists focused on helping lenders maintain the highest levels of borrower service. Informative Research has earned PCI and EI3PA compliant certifications for achieving the highest levels of security and data privacy. Informative Research, based in Garden Grove, California, is one of the nation’s top mortgage information service providers. Founded in 1946, Informative Research has established a mission to develop and deliver effective, reliable and secure mortgage technology solutions. Informative Research’s excellence in customer service has earned the trust of mortgage originators, servicers and quality control specialists throughout the country. For more information, visit http://www.informativeresearch.com.